Today is Ike’s 6th birthday. 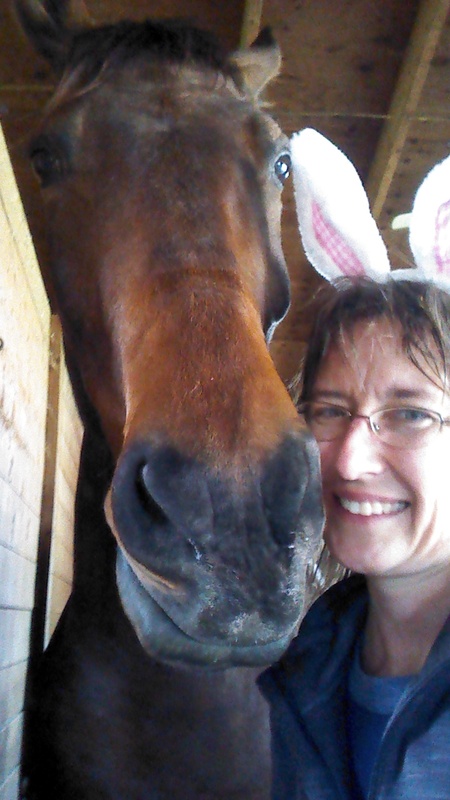 I still can’t believe how lucky I am to have found such a willing and able horse to ride on my dressage adventure. Happy Birthday Big Man! Looking forward to the years to come. There is sad news to share. My very first pair of Ariat tall boots finally said, “Enough! We just can’t do the day-to-day grind anymore.” My husband had to cut me out of the right boot because the replacement zipper decided to go full GI Joe kung fu grip and not let go. 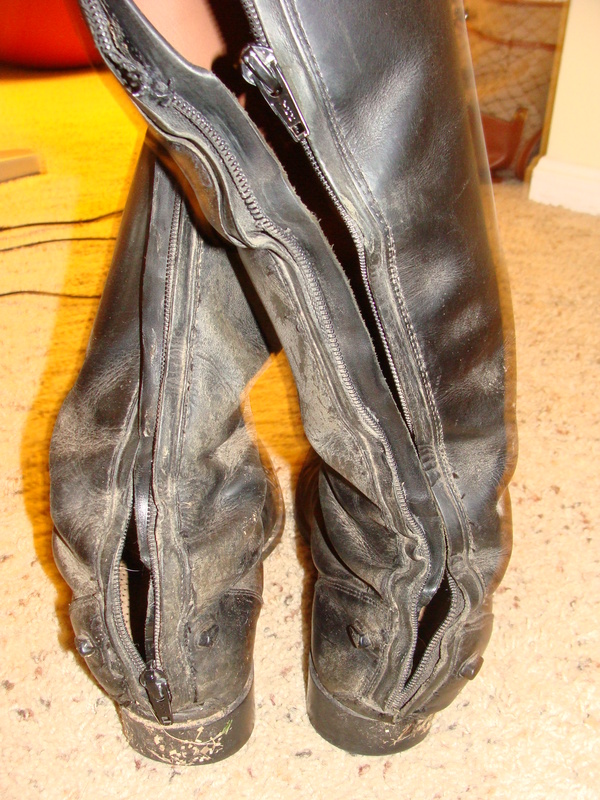 The original zipper is but a faded memory, and the boots just aren’t worth salvaging with a third zipper (that is if you can find anyone around here who will replace a riding boot zipper). I still remember purchasing the boots in 2005. Back then, I was naïve enough to think that $300 was a lot of money for a pair of riding boots; I now stand corrected and wish that the $300 boots available today fit my leg. I brought these shiny specimens home and lovingly took them from the box and thought, “How pretty! I’m never going to let them get muddy/stepped on/dirty.” Bahahahaahahahahaaa. Yeah, right. These poor boots were finally designated my everyday boots about 2 years ago which meant that they received as much love as my doormat. I see it every day, step all over it, but don’t spend much time cleaning it or maintaining it. I’m pretty sure the dirt and grim has been holding them together for the past 6 months. Fear not for my feet. There is an identical pair of Ariats waiting in the wings to take over daily duty. They still have a fighting chance to be used at schooling shows IF Ike can keep his hooves away from my feet, and I can take 2 minutes to wipe them down at the end of the day…My current show boots are a pair of DerDau’s that make my leg look like it is a mile long. I still walk like Frankenstein in these boots, but they were comfortable to wear in the saddle from day 1. 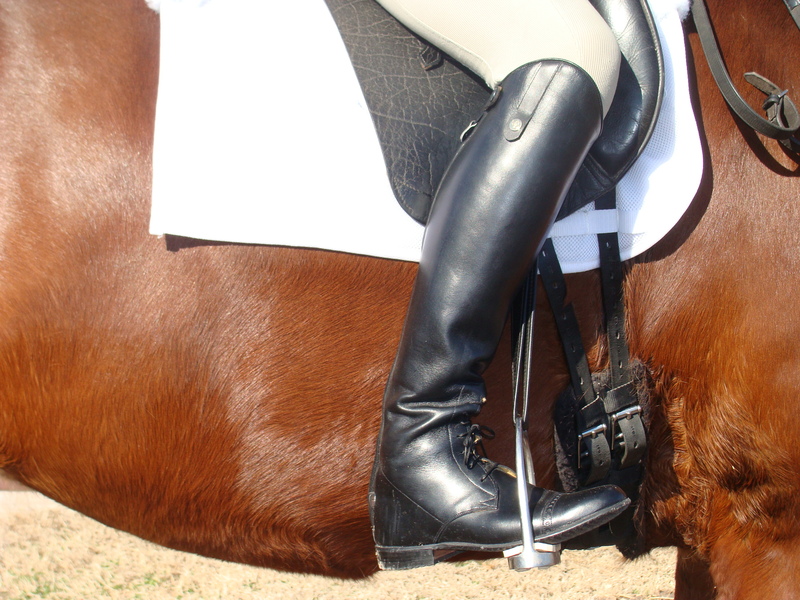 You might be wondering why a dressage queen like me selected a field boot. Well let me tell you – I tried on every make and model of field and dress boot available in my size that the closest tack stores had to offer. Some hit me in the wrong place at my knee. Some would fit in the ankle and be too big in the calf. Others would fit in the calf and ankle could do a cha-cha with all the extra room. I also found that dress boots were very uncomfortable across the top of my foot – they created an immediate pressure point that was not going to get any better. If and when I really have to have dress boots, I will cast my net wider or go custom. For now, I am very content. There is an elastic panel that runs parallel to the zip that gives the boot a custom feel through the lower leg. I have warned Ike to steer clear. I promise to take very good care of these. Still have not worked up the nerve to put my old boots in the trash. It seems a shame that I can’t find a use for the leather. Anyone have a puppy that needs a toy? Ready or not, show season is upon us. For some riders it started in April, but for Ike and I, it starts next weekend. After the lack of riding this winter due to weather woes and injuries from my unplanned dismount, I just didn’t feel confident enough to ride down centerline any earlier than May. I’m just glad that we were at least fit enough by mid-April to not get chastised by Hilda for lack of rider/horse fitness. Are we ready for those first scores of the season? Hmm, that would depend on what test we are getting ready to ride. For this first show, I wimped out and just couldn’t commit to riding all First Level tests. Since our goal is to make it to the Region 1 CBLM Championship Show (http://www.bglongaker.com/cblmain.htm ) that uses Test 2 as the qualifying test at each national level, I signed up for Training Level Test 2 both days, and First Level Test 2 on Saturday. I’d put money on my scores at Training being better than First. Some might say that we should just commit to First Level and be done with Training, but there are still days that Ike and I can’t get our act together. Well, more me than Ike. I still let him get too straight while riding a circle and lose control of the outside shoulder. I still let my reins get too long. I still lean forward in my canter transition. I let Ike’s haunches lead the way or get left behind in our leg yield. 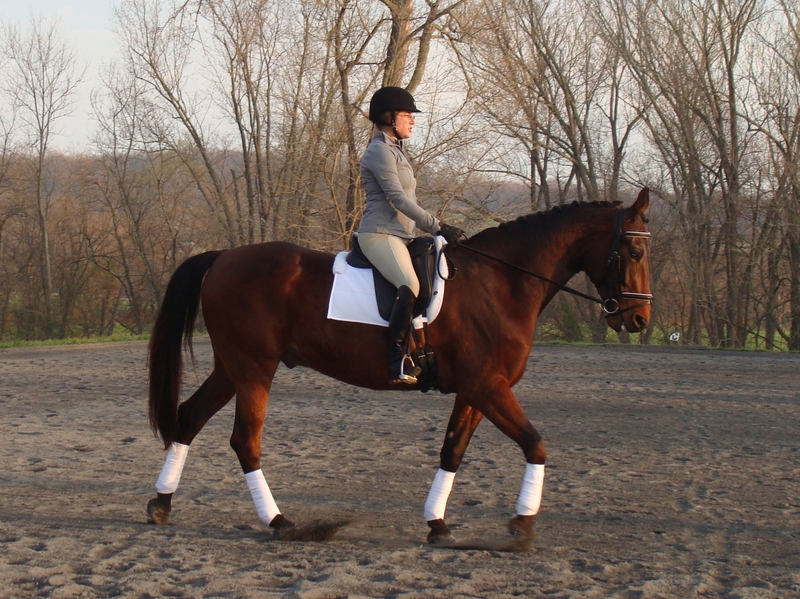 Our canter to trot transitions are not as smooth as they should be. I wish I was a more experienced rider some days, but I am who I am. Can’t really pretend to be anyone else. Our recent attempt at leg yield. For his part in our adventures, Ike tries his best to do what he thinks I’ve asked him to do. Of course, when my request is muddled, he has to play “Guess what Mom wants.” He guesses right more often than not which I appreciate. 🙂 His brother would take the opportunity to do whatever he thought would be fun (buck, bolt, cowkick). Ike appears to be quite fit for early in the year. When we were pushed during our lesson this week, Ike wasn’t even breathing hard when we finished. His canter is improving with every week, so I am hopeful that we will show the judges a solid canter rather than a “collected” gallop. As we prepare for the coming season, I also continue to work on and struggle with my sit trot. I am well aware that it is a necessary skill to continue my journey. Part of it is Ike’s back telling me to “get off” it now; part is me tensing my body and restricting his movement. I watched the upper level riders at the clinic and then the video of myself. Ugh! Why is it so easy for them and hard for me?! I so often feel like the remedial student that just can’t get their act together to graduate to the next level. Sit trot practice is now a daily exercise. Can I go from sitting to rising to sitting again without interrupting Ike’s rhythm and tempo? Sometimes yes, sometimes no. I would hate to think that I’m doomed to never leaving First Level because I lack this essential skill. Poor Ike. When you see the Craigslist advertisement for “Horse Seeking Proficient Rider,” you will know that Ike has given up on me. Luckily, the prep work on the trailer is done, Ike’s mane is pulled and his goat hairs have shed, so I can concentrate on riding in the coming week. Oh, yeah, and learning the First Level tests…yeah, that would be an essential skill as well. So glad Mom is wearing those dumb bunny ears. We’ve had some great work this past week including a tough lesson with Ms. C. There are only two weeks left before our first show of the season, so there is much work to be done before our debut at First Level at a rated show. What was I thinking?! Today is Ike’s brother’s 18th birthday. 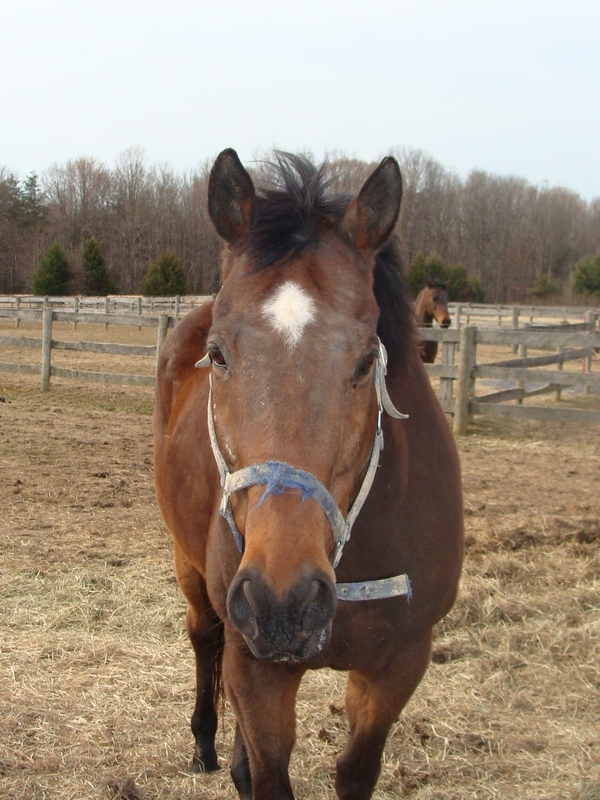 According to The Jockey Club, he turned 18 on January 1st, but I like to acknowledge the actual day. He has been a part of the family for 9 years. Cigar is incorrigible. 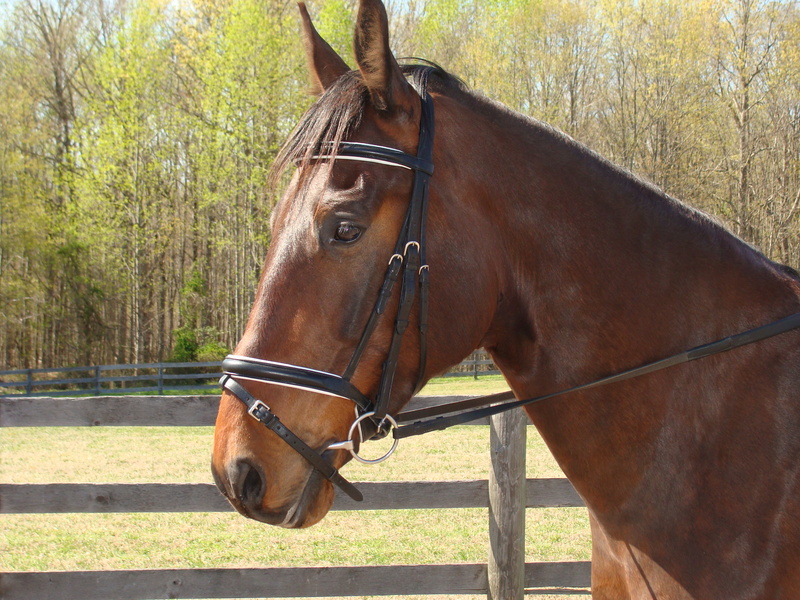 I tried my best to turn him into a dressage partner, but he fought me on each and every ride. In his mind, you could not win unless your nose was stretched far out in front of the rest of your body. It must have driven him crazy when I said that no, we could not gallop down centerline…although we actually did that at one schooling show when he decided the herd of sheep were to be feared. Holy Moly. What an amazing, overwhelming, humbling, inspiring weekend. I am not even certain where to start to capture all the details. Amazing to have met one of the legends of dressage. Overwhelming to have been selected even though Ike and I were the least experienced of the rider group. Humbling in so far as I realized that I know next to nothing about dressage. Inspiring to see the upper level riders and their talented mounts. If you want to know what I looked like, feel free to ask any of the 200 auditors. Yes, 2-0-0. I have never ridden in front of that many pairs of eyes; not even at the Region 1 championship last year. I unfortunately cannot publicize the videos of my ride, but suffice to say that Hilda pretty much pegged me after about a minute. Now, so can the 200 auditors. They will now have no fear when they see the name spastic rider getting hauled around by her larger than average pony when they are in one of my classes. “Don’t be afraid to use your hands.” “Relax your back.” “You are not sitting.” “Move your legs back.” “Where were you to help your horse?” “You forgot your corner.” She said nothing that Ms. C hasn’t told me before, and that I haven’t been working on for the past two years. I’m back to feeling like a beginner rider entering the arena for the first time. The nice thing is that I have learned that I’m not alone with my struggles to grasp the intricacies of this sport. So many of the auditors approached me after my ride to share with me their impressions of my lesson. Many said that they thought I handled it wonderfully and that it was great to see someone working at their level bravely attempting to follow Hilda’s instructions. I don’t know the names of these kind souls, but they helped me to rally and do it again on Sunday. My fabulous friends from my local chapter also gave me a shot in the arm to bolster my confidence to face the crowd for a second day. 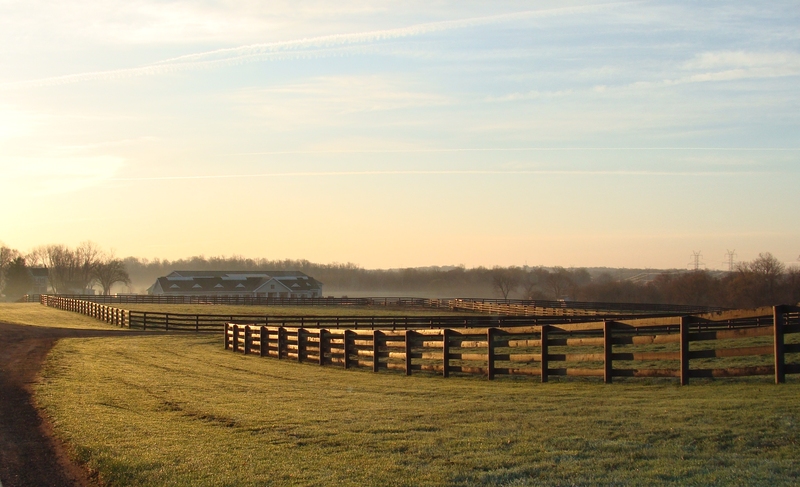 Sunrise over Wyndham Oaks Farm. Sunday dawned a gorgeous spring day. My dear friend Ms. L again made certain that Ike and I were impeccably turned out. What we lacked in dressage knowledge and skills, we made up for by looking marvelous. Ike and I were definitely more relaxed – not surprising given that we worked our butts off the day before. We’d each had a chance to dwell on what we’d learned the day before and hopefully improve our performance. I think I can confidently say that we showed improvement in our second lesson. Can I give myself a pat on the back that Hilda complemented me on being a good student? Awesome! She was a special education teacher for 14 years, so she knows a thing or two about teaching. 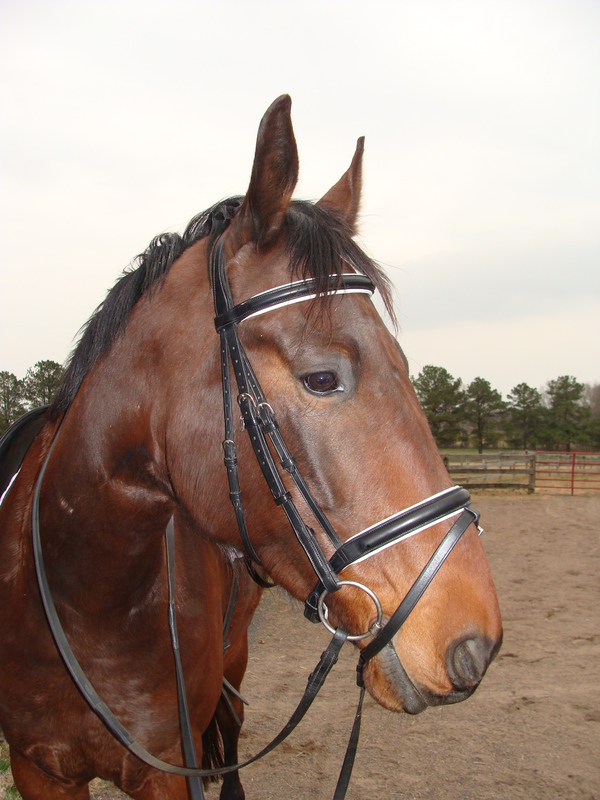 Ike showed clear improvement in his right lead canter – he was kind enough to not lean so much on my inside leg. I demonstrated better following hands at the walk and canter. I did some passable sitting trot work. We even attempted some centerlines and leg yield. 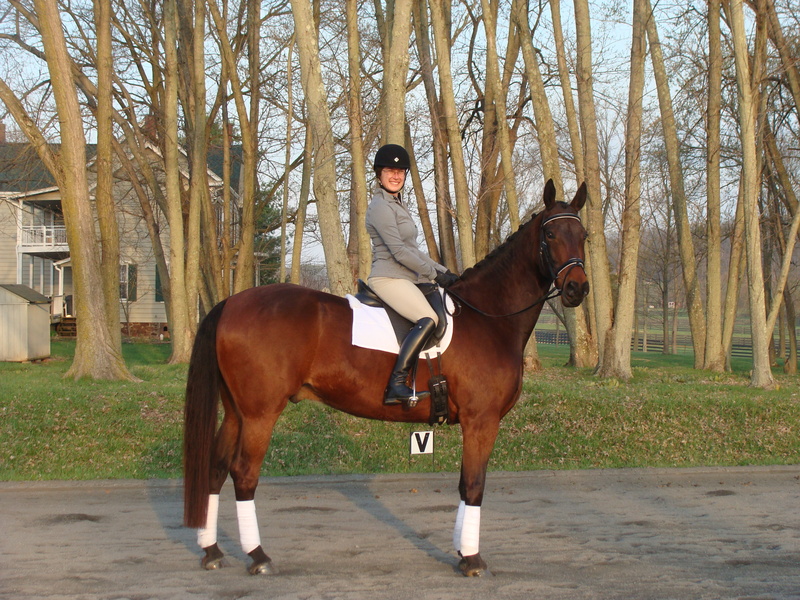 Our turns onto centerline were squirrely, but Ike was supple and responsive in his lateral work. The videos Ms. L recorded will help me to see for myself my errant ways (eek, what a funny face I make while concentrating and will you please stop doing THAT with your hands!). They confirmed with Ms. C that we are on the right track and that I need to be a better leader/rider in order for Ike to progress. The clinic helped me to realize that I should not be afraid to take chances. Yes, you will make mistakes when you take yourself outside of your comfort zone, but it is at that point that you will grow as a rider and the path up the levels will become just that more clear. Well, the time has finally come; we leave tomorrow for our first outing of the year. And did we pick a schooling show, a local clinic, or just a ride to another farm? Heck no, we are headed up to Boyds, Maryland to the scenic Wyndham Oaks Farm for the USDF/Nutrena Region 1 Hilda Gurney clinic. I must have lost my mind when I sent my application. I’ve seen the list of other riders. We are the pair that was selected to represent the beginning of the journey up the training scale. I can only hope that I make Ms. C, my husband, and my parents proud. I can only hope that Ike is the gentleman we know he can be rather than the spooky goof who runs from birds. Ike still has not finished shedding and the temperatures just aren’t quite warm enough for a full bath. I’ve done my best to make him look more presentable and less like a wooly mammoth. The bridle path still needs some final prep, but my arms ached from trying to reach the necessary height to get the job completed. Could someone please tell Ike to stop growing? The trailer is packed, the tack is clean, and my new boots are polished. A few hours of work in the morning and then let the adventure begin! !